Image caption Marcos Lobos: "Chavez was more than an icon"
President Hugo Chávez may have died six years ago but he is still watching over the Venezuelan capital. Wherever you go, you spot abstract images of his eyes graffitied on buildings. In the poor neighbourhood of 23 de enero, in the west of Caracas, his presence is even greater. It was here that the former leader organised a failed coup attempt in 1992. It is known as a traditional Chavista stronghold. Chávez graffiti and propaganda are sprayed on to many a wall. 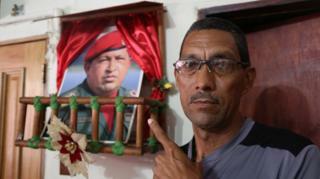 Marcos Lobos, 58, is one of Hugo Chávez's biggest fans. He lives in a 14-storey block of flats that is overlooked by the barracks where Chávez launched his coup and where the late leader was laid to rest after dying of cancer in 2013. Born and brought up in 23 de enero, Mr Lobos' entire family lives in the same block. On the building's front wall, there's a stencil that reads "Chávez, the heart of my homeland". Marcos shows me the "Chávez corner" in the living room. Above the television, there are dozens of pictures of the former leader. In some he is in his presidential garb, in another he is accompanied by Cuba's ex-President Fidel Castro. And in the middle of the wall, there is a clock, with Mr Chávez's face on it. "He was more than an icon, he represented hope and still does because his ideas were revolutionary," Mr Lobos says. "He was all about social equality and justice. He opened our eyes, created a national conscience about how to take Venezuelan politics to the people." His wife, Mirna, chimes in: "Before, it was all about the rich people, politically powerful people, and we had nothing," she says. "Chávez loved us. People thought that when Chávez died, we'd be buried with him but no," she says, adding that Nicolás Maduro is the "son" of Hugo Chávez so they are prepared to fight to keep him. "It's not Maduro's fault," she says of the deep economic crisis Venezuela is facing. Instead she holds the "empire" responsible, a reference to the US, which the Maduro government says has ruined the economy through its sanctions and through its opposition to Mr Maduro's socialist government. The whole family blames it for supporting Mr Maduro's critics. "The opposition has taken everything from us," she adds. But even in this pro-Chávez neighbourhood, the family is becoming more isolated. People are increasingly open about showing their discontent. President Maduro's approval ratings hover at around 20%. So even if Mr Maduro is Hugo Chávez's "son", is he as good a leader? Marcos's mother Teresa pauses and then says no. Image caption Teresa says supporters of the late President Chávez "have to be with Maduro"
"Maduro is Maduro, Chávez was something really special," she says. "But those who say they aren't with Maduro were never Chavistas [supporters of Hugo Chávez] because we Chavistas have to stand with Maduro," she says. "We have to support him because he's Chávez's legacy." According to Heinz Dieterich, a former adviser to Hugo Chávez, Mr Maduro has destroyed Mr Chávez's legacy. Mr Dieterich advocated what is known as "21st-Century socialism", a brand name that President Chávez adopted for his politics. So how do the two men compare? "Maduro became Machiavellian and the only thing that matters to him is hanging on to power. He's become a bourgeoisie usurper with a leftist discourse. Maduro doesn't just lack Chávez's brain, but his ethics too," Mr Dieterich says. Yet there are still Venezuelans who believe in Chavismo. Mr Dieterich puts that down to President Maduro's propaganda. "When you have a lie machine, you programme people," he says. "They don't see the facts anymore, they just interpret things through the state vision - newspeak and everything else. the reality, facts is fake news." "It's a mindset that you find in religious fundamentalists," he argues. "They don't interpret the world for what it is, but through their biblical vision. There's no way of changing that. That explains how many people who believed in Hugo Chávez and saw a future and a paradise in Hugo Chávez haven't managed to see Maduro in his true historic sense." Across town, in the sprawling slum of Petare, in the east of Caracas, an event is being put on in the name of peace and against imperialism. Everyone is expecting Mr Maduro to attend. A singer is belting out a tune that people are dancing to. "We don't want to be a North American colony," they chant, a dig at the increasing pressure coming from the US for Mr Maduro to step aside. In the crowds, people are wearing T-shirts with Hugo Chávez's eyes printed on the front. Others are voicing their support for Nicolás Maduro. Many are wearing the khaki uniform of Venezuela's civil militia. Ivonne Bravo is one of them. "The US wants the country's wealth but they need to remove their tentacles from Venezuela," she says. "There are warrior women here who are ready to defend the revolution and our President Maduro." Nicolás Maduro's supporters move on to another song, Vamos Nico (Let's go Nico). It is a rallying cry for these people to keep supporting their man in these difficult times. It is a faithful crowd but their numbers are dwindling.